The Timken Foundation has awarded Malone University $1.2 million to support the creation of a new Learning Commons and establish the Timken Foundation Center for Student Success in the institution’s Cattell Library. The creation of the Learning Commons will equip faculty and academic staff to help Malone students to develop the “love of truth and vibrant, mature faith” that is central to the Malone student experience. 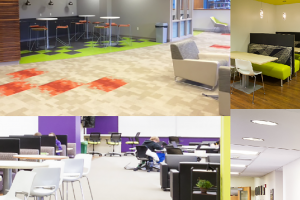 Adaptable and technologically enhanced spaces will facilitate individual learning, collaborative learning, informal learning, and relationship building. The Timken Foundation Center for Student Success, located within the Learning Commons space, will support students with a focus on retention, first-year advising, scheduling, tutoring, career planning, and disability services. The renovation will enable the Cattell Library to better serve as a resource for members of the Greater Canton community as a site for meetings, public events, and common spaces where educators can meet and work with students. The Learning Commons project is part of Malone’s $25 million Building a Bolder Vision Campaign that seeks to transform the student experience. Fundraising to complete the project is ongoing. For more information about the project, visit www.malone.edu/learning-commons.